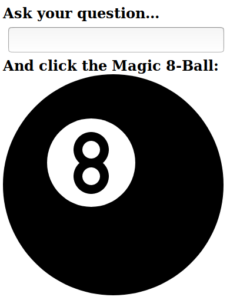 I built a React and CSS Magic 8-ball after being inspired by Free Code Camp’s React exercise. I hear people like screenshots. I completed my Responsive Web Design certification through Free Code Camp today! I’m back to working on Free Code Camp again… I hate leaving projects unfinished, but FCC has also made some changes to their usability and I think it’s a little more pleasant to use now. I’m currently working on the Responsive Web Design Certification. One of my final projects is a sample form. Free Code Camp: new and improved! I’ve been a Free Code Camp fan since I started my self-directed education… and now it looks like FCC has a new and improved curriculum. #100DaysofCode – but who’s keeping count? I have been under the weather… I don’t talk about my life with disabilities here, and I might someday (this was created for people in my circles to follow my journey after all), but for now I’ll just cryptically say that I’ve just been a little unwell, and I’m proud to say I’ve kept up with regular coding, but not regular blogging. I am now working on The Whisker Shop (link is a placeholder as of this writing, but this is the current working draft), my spouse’s cat furniture business he’s been talking about starting for years. We’re working together as a crossover Coursera project, as he’s currently in the project management specialization. It’s been a lot of fun so far. I’m also working on a Wikipedia Machine. I absolutely love working with APIs. They’re really frustrating and infuriating sometimes, but when they work, it’s so satisfying that it makes it all worthwhile. Practice, practice, practice. been working on my local weather app… it works! but it needs to be prettied up, and it needs to change based on the weather. Started working on a local weather app (which is subject to change/improvements without notice). My goal was to communicate with the API today, which I did, but I’ll add some style next. May end up taking a few days off from #100DaysofCode for medical reasons this week, but when I’ve had some bad days (I’m disabled), coding is something I can do more often than not… so it’ll be a good test to see what happens during an actual recovery-from-something-specific situation. My weather app goals: the FCC project has specific requirements, but when I’m done, I want to fork it and make it so users can enter cities or airport codes (or something) to get weather that way. Next, I’ll be working on this Free Code Camp project to display the weather. I completed Dr. Chuck Severence’s Internet History, Technology, and Security course on Coursera (verify here), and it was an outstanding overview of how we arrived where we’re at today, and helped me wrap my head around the backbone of our wired world. My only real experience with layered architecture was a very abstract understanding of the OSI model, and this course focused on the TCP/IP. I’ve realized that network architecture is really interesting, and I’d like to learn more. Learning more Python and becoming more comfortable with online learning environments has helped make learning more python and becoming more comfortable with online learning environments easier and more fun. There’s been a bit of a learning curve not only because this is a new format for me, but there are accessibility concerns I needed to navigate: Utilizing transcripts, bad connections, resource-intensive applications, avoiding flashing or glitchy videos, avoiding exacerbating chronic pain. This has all renewed my interest in Free Code Camp, which wasn’t a good fit when I first tried a few months ago, but it turns out that it’s actually really awesome. My tribute page to Victor of Aveyron was a Free Code Camp assignment, and an opportunity to learn more about disability history.